Multidrug-resistant (MDR) organisms have been increasingly reported at hospital admission. Recognising the magnitude, trend and predictors for MDR organisms in community-onset bloodstream infections (COBSI) is crucial for guiding empiric antibiotic prescribing. Positive blood culture isolates recovered from patients presenting to the emergency department during a ten-year period (1st Jan 2002-31st Dec 2011) were assessed. Trend analyses of MDR organisms were performed. Risk factors for COBSI caused by an MDR organism and predictors for 30-day mortality were also determined. A total of 1721 positive blood culture isolates were identified during the study period with a yearly incidence of 30-43 isolates/10 000 ED presentations. The proportion of MDR Escherichia coli causing COBSI increased from 9%-26% (P < 0.001), whilst methicillin-resistant Staphylococcus aureus remained at high levels (20%-30%). A total of 360 patients were included in a matched case-control (1:1) study, and residents in long-term care facilities (adjusted odds ratio [AOR], 4.9 [95% CI, 2.1-11.6]), home wound care (AOR, 5.5 [95% CI, 1.6-18.7]), underlying immunosuppression (AOR, 3.5 [95% CI, 1.6-7.7]), recent surgery (AOR, 3.5 [95% CI, 1.1-11.6]), and exposure to antibiotics within 3 months (AOR, 5.5 [95% CI, 2.8-10.6]) were independently associated with MDR COBSI. High risk source of COBSI, age and Pitt bacteraemia score were independent predictors for 30-day mortality. A concerning trend in MDR organisms causing bloodstream infection from the community is occurring. Risk factors for MDR organisms have been identified to assist in empiric antibiotic prescribing for those presenting to hospital with sepsis. Antimicrobial resistance in common bacterial pathogens causing community-onset infections, including bloodstream infection (BSI), has increasingly been reported, most notably methicillin-resistant Staphylococcus aureus (MRSA) and various multidrug-resistant (MDR) gram-negative bacilli (GNB) [1, 2]. This poses significant challenges to clinicians caring for patients presenting to hospital with suspected sepsis as empiric antibiotic prescribing is often targeting presumed, antibiotic-susceptible, community organisms. Identification of risk factors for MDR organisms in patients presenting from the community with sepsis is necessary to help optimise patient outcomes and minimise the use of broad-spectrum antibiotics. Emergency departments (EDs) serve as an important interface between community and hospital care; the microbial ecology is often a combination of community-and healthcare-associated organisms, the latter being driven by healthcare re-admissions. Friedman et al. proposed that healthcare-associated (HCA) bloodstream infection should be treated with broad-spectrum antibiotics to cover for MDR organisms . However, the broad nature of the HCA risk factors may lead to unnecessary use of last-line antibiotics, especially in settings with a low prevalence of MDR organisms . Several studies have worked towards refining predictors for MDR organisms in community-onset pneumonia [5–7]; similar work to predict MDR organisms in community-onset bloodstream infections (COBSI) remains scant. To date, the prevalence and trend of major MDR organisms causing COBSI remain poorly understood. Furthermore, data on risk factors and outcomes associated with COBSI due to MDR organisms are limited. Accordingly, we explored the longitudinal trend, risk factors and clinical outcomes associated with MDR organisms causing COBSI in a tertiary care institution. These data are critical in devising the most effective empiric antibiotics to maximise patient outcomes. We performed an observational series and a matched case-control study at The Alfred, a tertiary referral hospital in metropolitan Melbourne, Australia. We studied all cases of bloodstream infection presenting from the community to The Alfred’s ED. This ED provides specialised state-wide services for major emergency and trauma, burns, heart and lung transplantation, cystic fibrosis and neurosurgery patients. It attends to over 55 000 patients annually. The study was approved by the human research ethics committees of The Alfred and Monash University. Positive clinical isolates recovered from blood cultures of patients within 48 hours of ED admission during a ten-year period (1st January 2002 and 31st December 2011) were examined from a microbiology laboratory database. Repeat cultures from an individual patient growing the same organism within 14 days, cultures reported as normal flora or probable contaminants (eg. coagulase-negative staphylococci from a single blood culture bottle), and clinical specimens from patients aged < 18 years, were excluded. Species identification and antimicrobial susceptibility testing were performed using an automated system (Vitek®; bioMérieux). For the majority of the study period (Jan 2002-Jun 2010), susceptibility breakpoints were based on the British Society for Antimicrobial Chemotherapy (BSAC) guidelines . These were changed to the European Committee on Antimicrobial Susceptibility Testing (EUCAST) guidelines from July of 2010 . We observed no change in the proportion of resistant isolates at the time of the change in breakpoint definitions. The temporal trends of MDR GNB, MRSA, and vancomycin-resistant enterococci (VRE) were assessed. MDR was defined as being non-susceptible to at least three different classes of antimicrobial agents, as described elsewhere [10, 11]. For Enterobacteriaceae, seven classes of antimicrobials were assessed, (i) extended-spectrum penicillins or first-generation cephalosporins, (ii) β-lactam/β-lactamase inhibitor combinations, (iii) extended-spectrum cephalosporins, (iv) carbapenems, (v) trimethoprim/sulfamethoxazole, (vi) aminoglycosides, and (vii) quinolones. For non-fermenting GNB, antimicrobials were divided into five classes, (i) antipseudomonal penicillins, (ii) antipseudomonal cephalosporins, (iii) carbapenems, (iv) aminoglycosides, and (v) quinolones. Multi-resistant MRSA was defined as MRSA resistant to three or more of the following antibiotics: erythromycin, ciprofloxacin, gentamicin, trimethoprim/sulfamethoxazole, tetracycline, rifampicin, fusidic acid and vancomycin . The EMRSA-15-like strain was defined as MRSA resistant to ciprofloxacin +/- erythromycin only . All other MRSA were non-multi-resistant MRSA. For the Streptococcus pneumoniae strains, the susceptibility interpretation was based on non-central nervous system breakpoints. A matched case-control study was subsequently conducted for risk factor analysis. A case was defined as an adult (≥ 18 years) with COBSI (organism isolated from ≥ 1 blood culture within 48 hours of ED admission) due to a MDR organism. Only the first admission with COBSI due to a MDR organism was included in the analysis. Control patients were adults with COBSI caused by non-MDR organisms matched for the genus of the causative organism and the date of ED admission (± 1 year). If more than one control was identified, the control patient with the ED admission date closest to the case patient was chosen. Cases of polymicrobial bacteraemia, and patients who were directly transferred from other hospitals with a hospital stay > 48 hours were excluded. Information on patient demographics, sources of BSI, co-morbidities, recent bacterial infection and antibiotic use, invasive instrumentation in the preceding 48 hours, recent surgery, underlying immunosuppression, and the presence of healthcare-associated risk factors were reviewed. Sources of BSI were divided into low risk sources including urinary, skin and soft-tissue, and catheter-related, and high risk sources including respiratory, intra-abdominal, bone and joint, cardiovascular or unidentified . Co-morbidities were quantified using the Charlson comorbidity index . Presence of underlying immunosuppression was defined as the presence of neutropenia (absolute neutrophil count of < 500/mm3), concurrent use of high dose oral corticosteroids (at least 10 mg of prednisolone or equivalent for minimum of 30 days) or long-term use of immunosuppressive agents (e.g. cyclosporine), active chemotherapy for malignancy, metastatic cancer, or acquired immunodeficiency syndrome. Healthcare-associated (HCA) BSI was defined according to Friedman et al. . This included patients who had been hospitalised in an acute care hospital for ≥ 2 days in the preceding 90 days, residents of a nursing home or long-term care facility (LTCF), patients who received home intravenous (IV) therapy, specialised wound care, and those who underwent chronic haemodialysis or IV chemotherapy in the preceding 30 days. Information related to clinical presentation, management and outcomes of BSI was also collected, including severity of BSI according to the Pitt bacteraemia score [points assigned to specific clinical observations as (1) oral temperature of 35.1°C-36.0°C or 39.0°C-39.9°C scores 1 point, and a temperature of either ≤35°C or ≥40°C scores 2 points; (2) systolic blood pressure < 90 mm Hg for >1 hour despite adequate fluid resuscitation, receipt of vasopressors, and/or receipt of mechanical ventilation score 2 points each; (3) cardiac arrest scores 4 points; and (4) altered mental status scores 1 point for disorientation, 2 points for stupor, and 4 points for comatose] , presence of severe sepsis or septic shock, types and duration of empiric antibiotic therapy, length of hospital stay and mortality within 30 days of COBSI. Empirical antibiotic therapy was considered active when an antibiotic was given during the first 48 hours that had in vitro activity against the causative organism. Microbiological data were available from 2002 and denominator data on the number of ED presentations per year were available from 2004 onwards. A rate was calculated based on the number of isolates per 10 000 ED presentations per year. Bi-yearly trends in distribution of major organisms and antimicrobial resistance patterns were assessed using the chi-squared test for trend or linear regression. Risk factor analysis was performed using conditional logistic regression analyses, firstly by univariate, followed by multivariate analysis. Variables with a P < 0.1 on univariate analysis were eligible for entry into the multivariable model. The variables of ‘invasive instrument in-situ’, ‘underlying immunosuppression’ and ‘prior exposure to antibiotic’ were considered for inclusion in the multivariable model as binary variables, ignoring constituent variables within the categories. For correlated variables (pairwise correlation coefficient > 0.7), only one of the covariates was selected for inclusion into the candidate models on the basis of the strength of association. Independent variables in the final multivariable model were selected using a stepwise forward process. Model fit was assessed against the number of variables used, quantified using the Akaike information criterion to prevent overfitting. Risk factor analysis for COBSI caused by any MDR organism was performed first followed by a risk factor analysis for specific MDR organisms (MDR GNB and MRSA). In addition, categorical and continuous variables associated with 30-day all cause mortality were compared between the survival and non-survival groups using univariate and then multivariate logistic regression analyses. All tests were 2-tailed, and P-values of < 0.05 were considered statistically significant. Data analyses were performed using IBM SPSS Statistics version 20 (IBM, New York, USA). A total of 1721 positive blood culture isolates were identified over a 10-year period from patients presenting to the ED. From 2004 onwards, there was a yearly incidence of 30-43 BSI per 10 000 ED presentations (Table 1). Overall, gram-negative organisms (n = 941, 55%) predominated (Table 1). When adjusted for the number of ED presentations over time, the yearly incidence rate of gram-positive isolates declined over time (P = 0.02 for trend), whilst gram-negative isolates remained relatively constant (P > 0.05 for trend). NOTE. Data on the number of ED presentations was available from 2004. The proportion of MDR organisms according to genus is shown in Figure 1. Overall, Escherichia coli was the most common causative gram-negative organism. The proportion of MDR E. coli (n = 82) increased significantly during the study period from 9% (2002-2003) to 26% (2010-2011) (P < 0.001 for trend). Increasing resistance to important first-line agents was also observed from years 2002-2003 to 2010-2011; ceftriaxone (1% to 6%, P < 0.01), gentamicin (1% to 12%, P < 0.001) and ciprofloxacin (3% to 22%, P < 0.01). In contrast, the incidence of MDR Klebsiella spp. (n = 11) and other Enterobacteriaceae (n = 20) did not show a significant increase over time; however this may be partly explained by the small number of isolates. As expected, BSI caused by non-fermenting GNB were less common; however there were still 51 and 12 cases of Pseudomonas aeruginosa and Acinetobacter spp. in COBSI, respectively. MDR cases were also observed (2/51, [4%] for P. aeruginosa and 3/12, [25%] for Acinetobacter spp.). 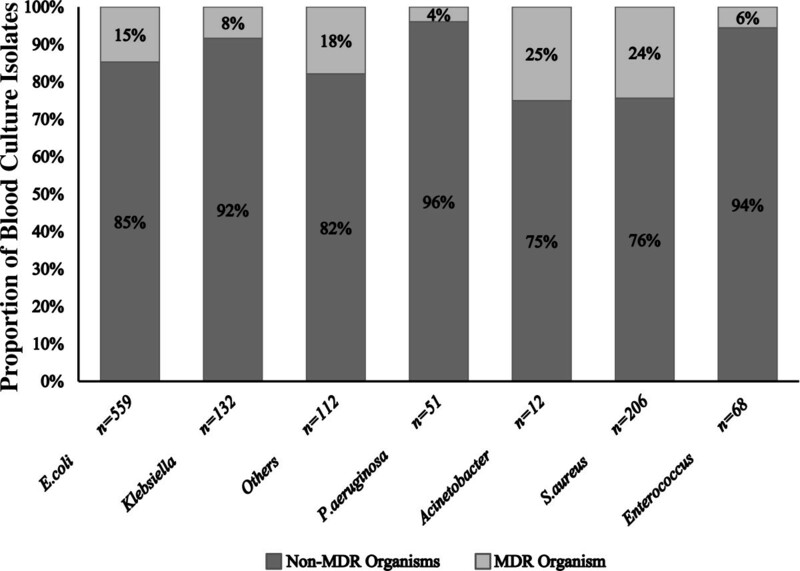 The proportion of MDR organisms versus non-MDR organisms in positive blood culture isolates, according to genus. ‘Others’ in the figure refers to other Enterobacteriaceae with ≥ 10 blood isolates during study period (ie. Proteus, Enterobacter, Citrobacter and Serratia spp.). MDR organisms in S. aureus refers to MRSA whilst in Enterococcus refers to VRE. S. aureus was the most common gram-positive organism causing COBSI (n = 206, 26%), with a stable yet high proportion of MRSA over time of 20%-30%. The majority of MRSA were of a multi-resistant phenotype (n = 41 [57%]), followed by EMRSA-15-like strains (n = 16 [22%]) and then non-multi-resistant strains (n = 15 [21%]). Over the 10 years, four VRE in COBSI were identified. About 10% of Streptococcus pneumoniae blood culture isolates (n = 104) were non-susceptible to penicillin; none of these were resistant to ceftriaxone. There were 194 MDR blood culture isolates identified from 2002-2011. Fourteen isolates were excluded; polymicrobial BSI (n = 7), multiple BSI episodes in the same patient (n = 3), direct transfer from other hospital (n = 1) and incomplete/missing medical histories (n = 3). Accordingly, 180 case patients were included, with 109 MDR GNB (comprised of E. coli [n = 79], Klebsiella spp. [n = 8], other Enterobacteriaceae [n = 17], P. aeruginosa [n = 2] and Acinetobacter spp. [n = 3]) and 67 MRSA in the subgroup analyses. The characteristics of case and control patients are shown in Table 2. Sources of COBSI due to MDR organisms composed primarily of urinary sites (n = 60, 33%) and unidentified sources (n = 53, 29%), followed by catheter-related (n = 18, 10%), skin and soft tissue (n = 16, 9%), bone and joint (n = 13, 7%), intra-abdominal (n = 10, 6%), and respiratory sites (n = 10, 6%). Overall, 82% of the case patients met the Friedman et al. criteria  for HCA BSI, however 40% of the control patients also had at least one of these defined risk factors. Multivariable analysis showed that residents in LTCF, home wound care, underlying immunosuppression, recent surgery and prior exposure to antibiotics were independent risk factors for COBSI caused by a MDR organism (Table 2). NOTE. OR, odds ratio; AOR, adjusted odds ratio; CI, confidence interval; SD, standard deviation; BSI, bloodstream infections; HCA, healthcare-associated. aVariables eligible for inclusion in the multivariate analysis. bLow risk sites are BSI secondary to urinary, skin & soft tissue and catheter-related sites. cPairwise correlation >0.7 with prior antibiotic exposure last 3mo. Subgroup analyses for specific risk factors for MDRGNB and MRSA are shown in Table 3. In addition to being a resident in a LTCF and prior exposure to antibiotics, home IV therapy and younger age were also independently associated with COBSI due to MDR GNB. Seven of 18 (39%) MDR GNB case patients with an age < 40 years had no identified predisposing risk factors and all but one were COBSI associated with a urinary source. On the other hand, hospitalisation in the last three months, residing in LTCF, receiving home wound care and underlying immunosuppression were independently associated with COBSI caused by MRSA. A significantly higher proportion of COBSI cases with MRSA (63/67, 94%) compared to cases with MDR GNB (81/109, 74%) fulfilled at least one Friedman et al. criteria (P = 0.001). NOTE. OR, odds ratio; AOR, adjusted odds ratio; CI, confidence interval; BSI, bloodstream infections; HCA, healthcare-associated; NA, not applicable. Community-onset BSI caused by MDR organisms was significantly more likely to be treated with inactive empirical antibiotic therapy (42% vs. 1%, P < 0.001). The median length of hospital stay for those infected with MDR organisms was 11 days (interquartile range [IQR] 6-20) compared with 9 days (IQR 5-17) (P < 0.05) for those with non-MDR organisms. The overall 30-day mortality observed in both groups was 13% (46 / 360), with 16% (n = 28) in those infected with MDR organisms as opposed to 10% (n = 18) in non-MDR infections (P = 0.127). The prognostic factors for 30-day mortality are shown in Table 4. Older age, higher Pitt bacteraemia score, and high risk sources of bacteraemia were independent predictors for mortality within 30 days of COBSI. Community-onset BSI caused by a MDR organism, receipt of inactive empiric antibiotic therapy and COBSI defined as HCA BSI were not significant predictors. NOTE. OR, odds ratio; AOR, adjusted odds ratio; CI, confidence interval; SD, standard deviation; IQR, interquartile range; LTCF, long-term care facility; BSI, bloodstream infections; ICU, intensive care unit; MDR, multidrug-resistant. bHigh risk sources refer to BSI secondary to respiratory, gastrointestinal, hepatobiliary, bone and joint, cardiovascular or unidentified sources. cPairwise correlation >0.7 with Pitt bacteraemia score. This study has shown that MDR GNB have joined MRSA as an important cause of bloodstream infection presenting from the community, highlighting the evolving challenges of empiric antibiotic prescribing for severe infections at the front-line of hospital admission. We identified differences in risk factors for MDR GNB and MRSA that are in keeping with the changing epidemiology of these organisms. The increase in MDR GNB was largely attributable to MDR E. coli, whereas MDR in non-fermenting GNB remained relatively uncommon. Traditional risk factors for infection with an MDR organism such as HCA risk factors proposed by Friedman et al. , appeared predictive for MRSA COBSI but were less predictive for MDR GNB infection. Patients with COBSI due to an MDR organism were more likely to be prescribed inactive empiric therapy and were associated with longer hospital stays; nonetheless, COBSI with an MDR organism was not related to significantly higher 30-day mortality. In the last decade, emergence of MDR GNB at hospital admission has been reported [1, 15, 16]. The most recent Australian surveillance data revealed an emerging trend of MDR E. coli in urinary isolates from the community, rising from 4.5% in 2008 to 7.2% in 2010 . Apart from the known increase in MDR GNB causing community urinary tract infections, fewer studies have focused on the trends in more severe community infections like bloodstream infection . Our data showed that a staggering 26% of E. coli bloodstream infection presenting to ED was MDR. Our standard first-line empiric therapy to cover GNB for suspected sepsis is often an aminoglycoside or a third-generation cephalosporin ; however 6% and 12% of blood culture isolates were resistant to these agents, respectively. Furthermore, 22% were resistant to ciprofloxacin. Identifying risk factors to help determine who should receive broader-spectrum antibiotics for patients presenting to ED with suspected BSI is needed. In contrast to previous studies [16, 19], older age was not shown to be a predictor for acquiring MDR organisms; on the contrary, older patients were less likely to have a COBSI with MDR GNB. Our data suggest a potential shift in the epidemiology of MDR GNB to a younger patient population, and this was not limited to patients with underlying medical conditions or predisposing healthcare-associated risk factors. This trend warrants further investigation into other potential community-acquired risk factors in this patient group such as travel and close contacts. A study by Kennedy and Collignon shows that approximately 50% of Australian travelers returning from high incidence countries such as India and China were colonised with drug-resistant E. coli and can remain colonised for months . As such, specific questioning about travel is now recommended for all patients with presumed infections at ED admission, with modification of empiric antibiotic prescribing if positive. Due to the retrospective nature of our study, these risk factors could not be evaluated. We observed a high rate of community-onset MRSA bacteraemia at 20%-30% throughout the 10-year study period. A nationwide surveillance of staphylococcal bacteraemia in Australia and New Zealand revealed that MRSA bacteraemia was no longer confined to hospitals and has become an issue in the community . The incidence of MRSA bacteraemia in the ED setting, however, has been less clear. Rather than being the traditional community phenotype of MRSA (nmMRSA), the majority of our MRSA infections (57%) were of a HCA phenotype (multi-resistant) in patients with healthcare-associated risk factors. These risk factors appear to be an important guide to adding empiric anti-MRSA cover in those with presumed staphylococcal bacteraemia. HCA BSI criteria were initially proposed by Friedman at el to help clinicians identify patients with a higher risk of acquiring MDR pathogen . Subsequently, this concept has been consolidated further with the introduction of the American Thoracic Society and the Infectious Diseases Society of America guidelines, which suggest use of broad-spectrum antibiotics for those who meet the HCA criteria for healthcare-associated pneumonia . Interestingly, in our study, 40% of those with COBSI caused by a susceptible organism (72/180) had a HCA risk factor (only two of these were infected with P. aeruginosa). This suggests that further studies are required to refine the risk factors for an infection caused by a MDR organism presenting to the ED in order to prevent overuse of broad-spectrum antibiotics. The impact of antibiotic resistance on treatment and patient outcomes has varied considerably between studies [22–24]. One of the most consistent findings however is that infection with a MDR organism leads to an increase in receipt of inactive empiric antibiotic therapy [25, 26]. Our data showed an association between inactive empiric therapy and 30-day mortality but this was not statistically significant after controlling for other confounders. The adverse consequences of inactive empiric therapy on increasing mortality in BSI remain inconsistent in the literature, especially for gram-negative bacteria, and depend on the source and severity of bacteraemia [27, 28]. In our study, the high risk source of COBSI and higher Pitt bacteraemia score were shown to be independent predictors for mortality. However, severe sepsis/septic shock were not independent predictors and this was due to the fact that these covariates were captured within the Pitt bacteraemia score (correlation coefficient was > 0.7, Table 4). Although the presence of MDR organisms in COBSI was not associated with increased 30-day mortality, it was associated with an increase in length of hospital stay. Importantly, the economic impact of infections associated with MDR organisms originating from the community warrants further investigation to facilitate healthcare resource allocation. The current study has several limitations. Due to its retrospective nature, risk factors such as recent travel, history of colonisation or close contacts with MDR organisms could not be assessed. Furthermore, mechanisms of resistance such as the presence of extended-spectrum β-lactamases or carbapenemases were not elucidated. An automated system (Vitek®) was used for susceptibility testing and therefore exact minimum inhibitory concentrations were not reported. This study was conducted at a large tertiary ED in southern Australia, and thus the results may not be generalisable to other EDs with different patient demographic profiles or clinical burden. This work has highlighted concerning trends toward greater antimicrobial resistance in common pathogens causing COBSI. An ideal model to predict COBSI with MDR organisms may incorporate a number of clinical factors (e.g. prior exposure of antibiotics, underlying immunosuppresion), relevant healthcare-associated risk factors, and possibly organism-specific risk factors (e.g. recent travel and MDR Enterobacteriaceae). These studies are essential to assist with the challenges of empiric antibiotic prescribing for those presenting to hospitals with suspected sepsis. David CM Kong and Anton Y Peleg contributed equally to this work. The authors would like to thank Kerrie Watson and Phuong Pham from The Alfred for maintaining the microbiology database for this surveillance. A PhD scholarship to CJL by University of Science Malaysia is gratefully acknowledged. AYP acknowledges funding support from an Australian National Health and Medical Research Council Career Development Fellowship (1047916) and support from a Monash University Strategic Grant Scheme. Preliminary data of the work described in this manuscript was presented at the 13th Annual Scientific Meeting of Australian Society of Antimicrobials (ASA), Brisbane, Australia, 23rd-25th February 2012. DCMK has sat on advisory boards for Merck Sharp & Dohme (MSD), and Pfizer, and receives financial/travel support (not related to the current work) from Pfizer, Roche, Novartis, MSD and Gilead Sciences. AYP has been to one advisory board meeting for Abbott Molecular, Ortho-McNeil-Janssen, Pfizer and AstraZeneca, and has received a speaker’s honorarium from AstraZeneca and MSD for one presentation each. Other authors: none declared. CJL contributed to the conception and design of the study, conducted data collection and interpretation, performed the statistical analysis and drafted the manuscript. ACC, DCMK and AYP were part of the conception of the study and participated in refining the study design, data interpretation and providing statistical advices, as well as revising the manuscript. AYP was also involved in critically appraising the manuscript and taking responsibility for the paper as a whole. All authors read and approved the final manuscript.